SAN DIEGO – “We Build, We Fight” has been the motto of the U. S. Navy’s Construction Force, known as the “Seabees,” for the past 75 years. A 2010 Spring Valley High School graduate and Nanuet, New York, native builds and fights around the world as a member of an amphibious construction battalion center located in San Diego, California. 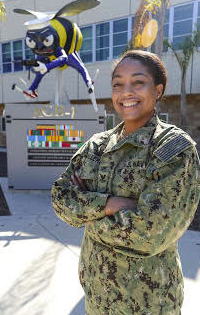 Petty Officer Second Class Shelly Caballero works as a personnel specialist in the Navy assigned to Amphibious Construction Battalion One (ACB 1). ACB 1 provides ship-to-shore transportation of combat cargo, bulk fuel and water, and tactical camp operations supporting Navy and Marine Corps amphibious force operations. As a personnel specialist, Caballero is responsible for managing records of sailors’ personnel files and makes sure they get paid correctly and on time. Caballero has carried lessons learned from her hometown into to her military service. Caballero is a first generation servicemember and is proud to represent her family in the Navy. “I’m the first one in my family to join the military. I’m very proud of that fact. It gives me a great sense of satisfaction,” she said. “”The Seabees have built a legacy over these past 74 years. I am proud of that tradition and of what our Seabees are doing everyday around the globe. I am privileged to serve with them again here at Amphibious Construction Battalion One; seeing their talents, teamwork, and dedication, I am proud and confident of their future and the heritage that Seabees continue to build today,” said Capt. Scott O. Cloyd, commanding officer, ACB 1. Caballero proudest accomplishment is getting the opportunity to lead. Serving in the U.S. Navy, has allowed Caballero to continue learning about the legacy for future Seabees.